Portal axles (or portal gear) are an off-road vehicle suspension and drive technology where the axle tube or the half-shaft is off-set from – usually above – the center of the wheel hub and where driving power is transferred to each wheel via a simple gearbox, built onto each hub. This gives two advantages: ground clearance is increased, particularly beneath the low-slung differential housing of the main axles — and secondly, any hub reduction gearing allows the axle halfshafts to drive the same power but at reduced torque (by using higher shaft speed). This reduces load on the axle crownwheel and differential. The portal gear configuration is also sometimes called a drop gear or drop gearset configuration (which, despite its similarity to the term dropped axle, produces the opposite effect). Compared to normal layout, portal axles enable the vehicle to gain a higher ground clearance, as both the axle tube and differential casing are tucked up higher under the vehicle. Due to the gear reduction at the wheel which lessens the torque on all the other drivetrain components, the size of the differential casing can be reduced to gain even more ground clearance. Additionally, all drivetrain elements, in particular the transfer gearbox and driveshafts, can be built lighter. This can be of use in lowering the center of gravity for a given ground clearance. Where a vehicle also requires a reduced top speed, in at least one gear, the gear ratio can be chosen to reduce this. The military Kübelwagen of WWII used a ratio of 1.4:1 to provide a 2.5 mph walking speed in first gear, as well as a useful lift of 50 mm. As they require a heavier and more complex hub assembly, however, these systems can result in an increased unsprung weight and require robust axle-control elements to give predictable handling. In addition, at higher speeds the hub assembly can overheat. They are also used in railways and low floor buses although, in the case of buses, the device is engineered in the opposite way to those fitted to off-road vehicles - the axle is below the center of the wheel. Thus, the inverted portal axle allows the floor of the bus to be lowered, easing access to the bus and increasing the available cabin height. Bolt-on Portals (or drop boxes) are a housing with a set of gears which bolts onto the final flange of the axle tube. This approach allows existing vehicles to be converted to portals without modifying the axles (Volvo C303 or Unimog 404). Mercedes-Benz G500 4×4² and G63 AMG 6x6 6x6 truck. A related development is the use of an epicyclic hub gearbox. This is mounted in-line with the halfshaft, so that there is no change in ride height. They are often used for large and heavy vehicles, where the wheel diameter already gives adequate ground clearance. The reduction gearbox allows the halfshafts to turn faster than the wheels, thus requiring less torque for the same power. This permits a smaller and lighter halfshaft and internal drivetrain. Hub gearboxes are found on many large quarrying dump trucks and they were also an iconic feature of the Alvis FV600 chassis vehicles, such as the Stalwart and Saracen. The FV600 used a version of the DAF H-drive, with a single differential between sides and all wheels on each side linked by an internal driveshaft and bevel gearboxes to the halfshafts. This has no differential axle between wheel stations on each side and so 'wind-up' was a regular problem for these vehicles when driven on roads. If individual wheels were out of phase with their neighbours, possibly caused by cornering or slightly varying tyre diameter, this could place a considerable force on the gearbox, leading to breakages. For this reason, it was regular practice when driving on tarmac to bump the vehicle over a kerb or other object at times, to allow this wind-up to be released. On slippery surfaces like sand or mud there is enough slippage between the tyres & ground to dissipate the tension. 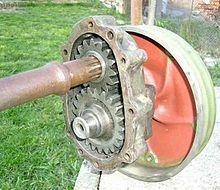 Wikimedia Commons has media related to Portal axles. ^ "New Spicer portal axles for compact utility tractors - introduced by Off-Highway Systems Group of Dana Corp". Diesel Progress North American Edition. ^ a b Ludvigsen, Karl (2014). Professor Porsche's Wars. Pen & Sword Military. pp. 134–135. ISBN 978-1-52672-679-7. This page was last edited on 14 April 2019, at 09:09 (UTC).